For filing in tight places where adjoining areas could be damaged, use a barrette file. Only one side has teeth and the other edges slope away from them. They come in several sizes and every coarseness you could need. They are even included in most needle file and mini-needle file sets. I was wondering if you carry a piece of equipment or a tool that helps one to create a beveled edge on metal? I want to put a beveled edge on some of the metal I bought from you but have no clue as to how to go about it. Is there a cheap and an expensive way? Whatever advice would be appreciated. 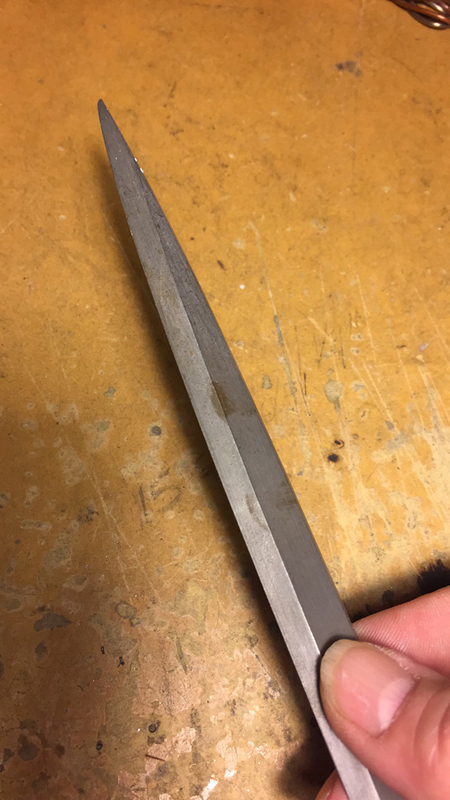 To bevel the edges of metal, you’ll just need a flat hand-file. Nicholson is a good American brand, available at most hardware stores. Buy one with a handle. You’ll file better if your hand isn’t being poked with a steel tang. You can also buy a handle separately and install the file yourself. Remember that a file only works on the push stroke. Hold the metal against something solid, like the edge of a table, so that an edge faces up. Hold your file at a 45 degree angle to the edge of the metal. Push. I think of it as cutting off the corner of the edge of the metal. 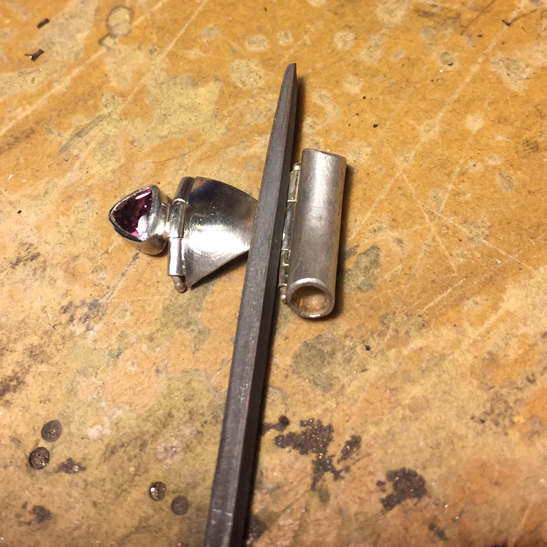 The steeper the angle between the file and the edge of the metal, the more bevel you’ll have. If you are doing a lot of pieces, use blue painter’s tape to adhere 150 or so grit sandpaper to a flat table. Hold the metal at a 45 degree angle, being sure to support it carefully so that it doesn’t bend, and pull the metal toward you. This sandpaper-on-the-table thing is also my favorite way to get nice round corners on metal sheet. I keep a piece of 150 and a piece of 400 grit taped to my table at all times.